The brown marmorated stink bug has a bad reputation. And for good reason: every summer, this pest attacks crops and invades homes, causing both sizable economic losses and a messy, smelly nuisance—especially in the eastern United States. A new study by entomologists at the University of Maryland shows that these pests, known simply as stink bugs, have a strong preference for ripe fruit. Moreover, stink bugs track their favorite fruits throughout the growing season in an effort to maximize their access to food. The study, published online June 25, 2015 in the Journal of Pest Science, reports the numbers of stink bugs feeding on nearly 4,000 fruit-bearing ornamental trees representing more than 200 popular varieties grown for sale at commercial nurseries. The researchers found that trees with ripe fruit attracted more than twice as many adult stink bugs compared with trees bearing immature fruit. Moreover, when the researchers removed all fruit from more than 30 trees, stink bugs lost interest and almost totally disappeared from those trees. The findings could help guide strategies to control stink bug populations. By preferentially planting fruitless varieties of ornamental trees and/or planting varieties that bear fruit early in the growing season when the number of stink bugs is lower, landscapers and homeowners could become a crucial line of defense in the annual battle to control this damaging invasive pest. Because of the toll that stink bugs can exact on agricultural crops, most stink bug studies have focused on single, economically important crops such as apples, peaches, soybeans and corn. But stink bugs are currently known to attack at least 120 plant species. Thus, Martinson and her colleagues focused on a wide variety of ornamental trees in nurseries, where food availability for stink bugs is sporadic and unpredictable, to more closely reflect the real-world dining habits of these voracious pests. The current study provides some critical intelligence in the battle against stink bugs and their annual buffet of destruction. Stink bugs spend the winter in human-made structures, where they lay dormant in eaves, rafters and storage areas. When they first emerge in the spring and begin laying eggs, their main source of food is not agricultural crops, but rather fruit-bearing ornamental trees commonly found near homes and along city streets. As these sources of food become depleted and/or the fruit begins to decline in quality, stink bugs move on to other plant varieties that are hitting their peak. In late summer and early fall, when stink bugs begin seeking shelter for the winter, they will take advantage of late-fruiting ornamental trees near homes and other buildings. Thus, limiting the availability of fruit both in spring and fall could prove to be the one-two punch needed to control stink bug populations. The team is creating a list of ornamental tree species that stink bugs prefer. Eventually, this list could help inform landscapers and homeowners which species of trees to avoid planting, especially close to homes and other structures. On the other hand, stink bugs will ignore some trees altogether, either because their fruit is unappealing or they do not bear fruit at all. Building this second list of tree species that stink bugs avoid is also a high priority for the researchers. Given the ubiquity of stink bugs in the summer months, the researchers have plans to involve the broader community in future efforts. This work was supported by the U.S. Department of Agriculture’s National Institute of Food and Agriculture (Award Nos. 1003486 and 2011-51181-30937). The content of this article does not necessarily reflect the views of this organization. 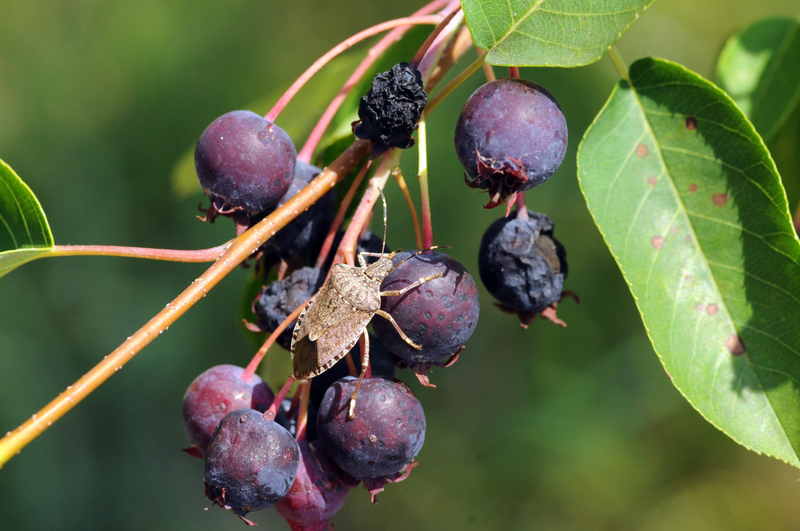 The research paper, “Fruit availability influences the seasonal abundance of invasive stink bugs in ornamental tree nurseries,” Holly Martinson, Dilip Venugopal, Erik Bergmann, Paula Shrewsbury, and Michael Raupp, was published online June 25, 2015 in the Journal of Pest Science.